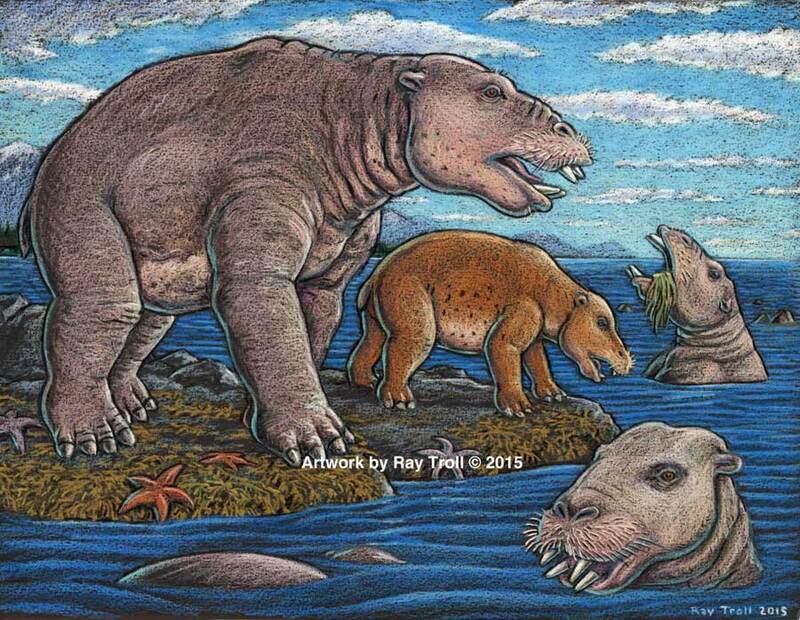 Scientists have identified a new species of a strange marine mammal group that lived on the Pacific Coast between 33 million years ago and 10 million years ago. The new specimens — from at least four individuals — were recovered from Unalaska, in theAleutians. Their strange columnar teeth and odd style of eating don’t occur in any other mammal. They rooted around coastlines, ripping up vegetation, such as marine algae, sea grass and other near-shore plants. 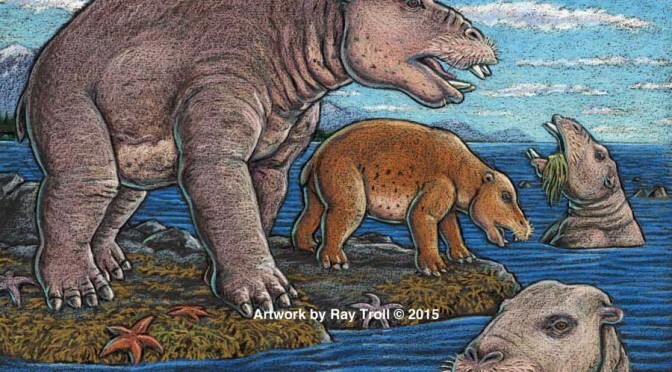 The new species, 23 million years old was a big, hippo-sized animal with a long snout and tusks, It has a unique tooth and jaw structure that indicates it was not only a vegetarian, but literally sucked vegetation from shorelines like a vacuum cleaner, said vertebrate paleontologist and study co-author Louis L. Jacobs, Southern Methodist University, Dallas. They probably swam like polar bears, using their strong front limbs to power along. On land, they would have had the lumbering gait of a sloth. A large, stocky-limbed mammal, desmos’ modern relatives remain a mystery. Scientists have previously linked the animals perhaps to manatees, horses or elephants. Adult desmostylians were large enough to be relatively safe from predators. The identification of a new species belonging to Desmostylia has intensified the rare animal’s brief mysterious journey through prehistoric time, according to the new study. While alive, the newly discovered creatures lived in what is now Unalaska’s Dutch Harbor. To eat, the animals buttressed their lower jaw with their teeth against the upper jaw, and used the powerful muscles that attached there, along with the shape of the roof of their mouth, to suction-feed vegetation from coastal bottoms. Big muscles in the neck would help to power their tusks, and big muscles in the throat would help with suction. The new specimens also represent a new genus — meaning desmostylians in the same family diverged from one anoher in key physical characteristics, particularly the tooth and jaw structure, said Jacobs, who is one of 10 scientists collaborating on the research. Discovery of a new genus and species indicates the desmostylian group was larger and more diverse than previously known, said paleontologist and co-author Anthony Fiorillo, vice president of research and collections and chief curator at the Perot Museum of Nature and Science, Dallas, and an adjunct research professor at SMU. “Our new study shows that though this group of strange and extinct mammals was short-lived, it was a successful group with greater biodiversity than had been previously realized,” Fiorillo said. Compared to other mammals, desmos were latecomers and didn’t appear on earth until fairly recently — 33 million years ago. Also unusual for mammals, they survived a mere 23 million years, dying out 10 million years ago. The research was funded by the Perot Museum of Nature and Science, U.S. National Park Service – Alaska Region Office, and SMU’s Institute for the Study of Earth and Man. The newest desmo made its home on Unalaska Island, the farthest north of any occurrence of the group, which only lived along the shores of the North Pacific. “That’s the only place they’re known in the world,” Jacobs said. The Unalaska fossils represent at least four individuals, and one is a baby. In addition, “the baby also tells us that this area along the Alaska coast was biologically productive enough to make it a good place for raising a family,” said Fiorillo. Just as cattle assemble in a herd, and a group of fish is a school, multiple desmostylians constitute a “troll” — a designation selected by Jacobs to honor Alaskan Ray Troll, the artist who has depicted desmos most. The first Unalaska fossils were discovered in the 1950s in a rock quarry during U.S. Geological Survey mapping. Others found more recently were on display at the Ounalashka Corporation headquarters. Those specimens were offered to Fiorillo and Jacobs for study after Fiorillo gave a public presentation to the community on his work in Alaska. From there, the researchers discovered that the fossils were a new genus and species. The researchers named the new mammal Ounalashkastylus tomidai. “Ounalashka,” means “near the peninsula” in the Aleut language of the indigenous people of the Aleutian Islands. “Stylus” is from the Latin for “column” and refers to the shape of cusps in the teeth. “Tomida” honors distinguished Japanese vertebrate paleontologist Yukimitsu Tomida. The article appears in a special volume of Historical Biology to honor the career accomplishments of Tomida upon his retirement from the Department of Geology and Paleontology in Tokyo’s National Museum of Nature and Science. In addition to Jacobs, Fiorillo and Polcyn, other authors were Yosuke Nishida, SMU; Yuri Kimura, Smithsonian Institution and the Tokyo Museum; Kentaro Chiba, University of Toronto; Yoshitsugu Kobayashi, Hokkaido University Museum, Naoki Kohno, National Museum of Nature and Science; and Kohei Tanaka, University of Calgary.